Letter to Editor Calling President Obama "No Ordinary Weakling"-Confirmed Authorship! - Truth or Fiction? Letter to Editor Calling President Obama "No Ordinary Weakling"-Confirmed Authorship! 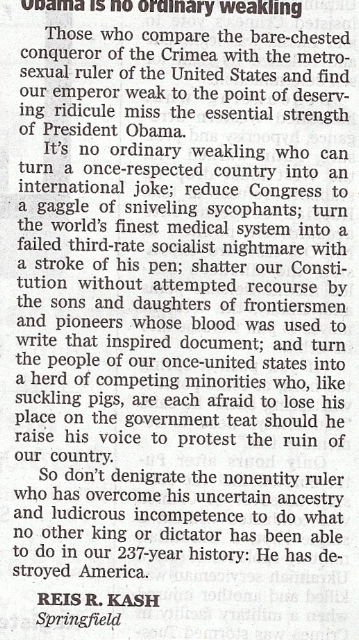 Letter to Editor Calling President Obama “No Ordinary Weakling”-Confirmed Authorship! This is an email with an image of a letter to the editor that said President Obama is “no ordinary weakling” when dealing with Russian President Vladimir Putin. The letter to the editor was written by Reis R. Kash of Springfield, Oregon and submitted to the Register-Guard of Eugene Oregon. Those who compare the bare-chested conqueror of the Crimea with the metrosexual ruler of the United States and find our emperor weak to the point of deserving ridicule miss the essential strength of President Obama. It’s no ordinary weakling who can turn a once-respected country into an international joke; reduce Congress to a gaggle of sniveling sycophants; turn the world’s finest medical system into a failed third-rate socialist nightmare with a stroke of his pen; shatter our Constitution without attempted recourse by the sons and daughters of frontiersmen and pioneers whose blood was used to write that inspired document; and turn the people of our once-united states into a herd of competing minorities who, like suckling pigs, are each afraid to lose his place on the government teat should he raise his voice to protest the ruin of our country. So don’t denigrate the nonentity ruler who has overcome his uncertain ancestry and ludicrous incompetence to do what no other king or dictator has been able to do in our 237-year history: He has destroyed America. "American Suicide" a speech by Former Colorado Governor Richard Lamm-Truth!